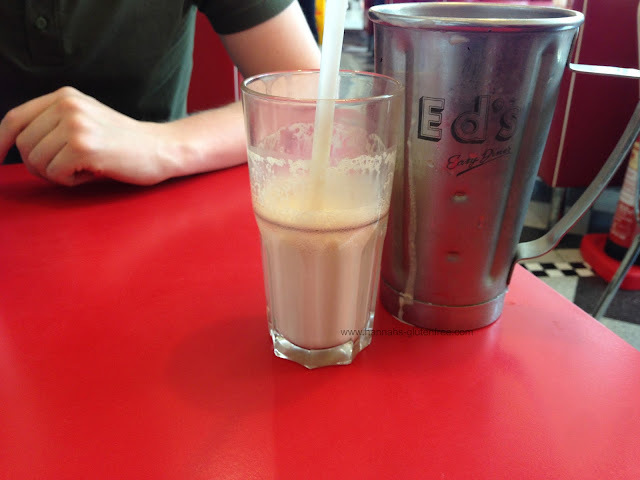 Yesterday we took a trip to Ed's Diner to try out the newish gluten free menu. I was so excited I honestly didn't know what to pick. With a wide range of burgers and hot dogs it is honestly a gluten free heaven! I toyed with the idea of a hot dog because I haven't had one in such a long time, as many places do gluten free burger buns now, but then I decided on a burger anyway as I wanted to see how well the bread roll had been executed. 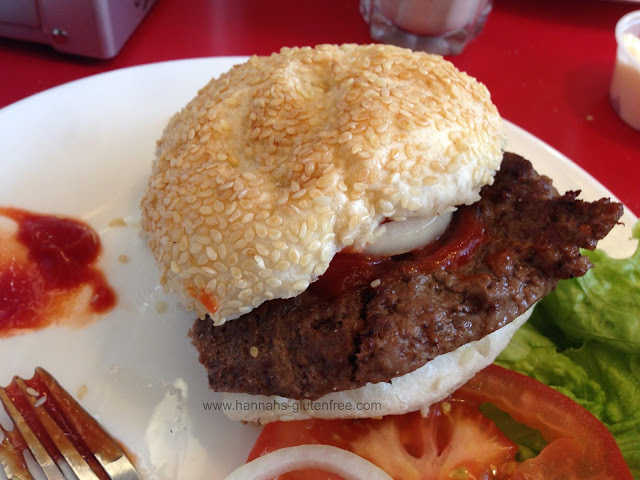 I love GBK but I find sometimes their rolls can be on the dry side, so I thought I would try an Ed's Diner burger to compare. I finally decided on the classic after much deliberation, which surely is a first for us free fromers, having an actual choice! 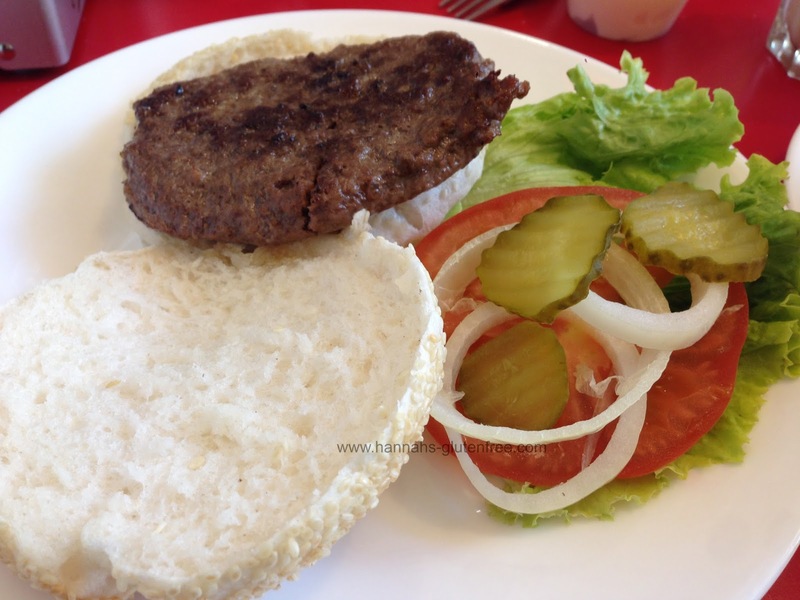 The classic consisted of a beef burger, bun, tomato, lettuce, onion and gherkin. You can't beat a classic burger and I thought it would be a good place to start. I also had the chocolate milkshake and the cheese and bacon fries. The chocolate milkshake was amazing, very much like the ice-cream milkshakes I make at home. For almost £5 you get a metal jug with two servings. I would suggest if you were to have a milkshake to either go light on the sides or have none at all, as they are quite filling. The chocolate was not an artificial taste, which is one of my greatest pet peeves in life. Over the years James has made me realise I am actually very fussy about the quality of my chocolate, the flavour and the brand. So if this met my apparently fussy high standards (which I don't think I have! ), they must be onto a winner! When the burger arrived it was served in a typical sesame seed bun, very much like the type you find in any fast food burger place for a mainstream audience. It was so similar to the real thing I was glad James had a regular bun so I could compare. The burger itself came with all the elements separate so you could build it yourself. The burger was of good quality and all the salad was crisp and fresh. Combined with the super soft, fluffy bun, it is honestly hands down the best burger I have eaten out. The chips on the other hand were not so to my liking. I really enjoyed the plain chips and think they are cooked beautifully, but the cheese sauce was WAY too overpowering and there was way too much of it. I couldn't actually finish them as they were completely not to my taste and would have spoilt my meal. The chips lower down were so saturated I picked round the ones I could and left the rest. Next time I will definitely save the extra couple of pounds and have plain ones! Saying that if you love a rich cheesy sauce these would be perfect for you! But I think it is great to have more than one option of chips, you can even have chilli chips! YUM! 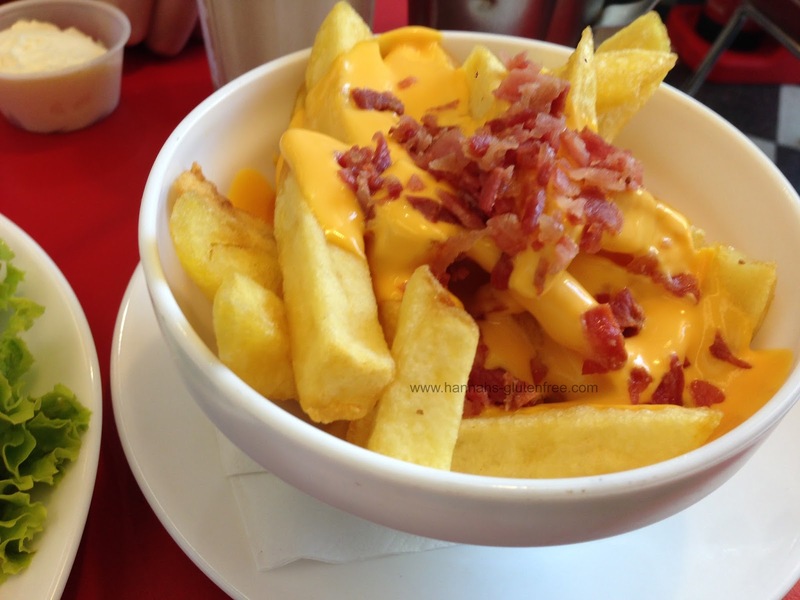 I think Ed's diner is a fantastic place to eat as it is accredited by coeliac UK and I was perfectly well after leaving, no bloating or any signs that there was even a drop of cross contamination. The menu is very extensive and have a wide range of options you do not tend to find, including hotdogs and chips, and different varieties of them! Our meal averaged at £15 per head so I think that is a fantastic deal for the amount of food and drink that was presented to us! Seeing as they have a loyalty card and so many gluten free options many options, I'll just have to go back to try a hot dog now... It'll be rude not to!